We’ve seen some leaked photos of the BlackBerry Z30, but we don’t know when BlackBerry plans to make it an official product. Well, we still don’t know, but check out this leaked photo that is the talk of the CrackBerry forums. 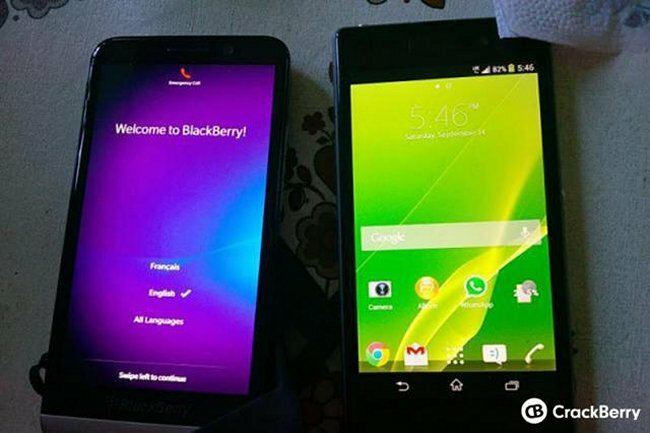 It shows the BlackBerry Z30 next to the next Sony Xperia Z1 which was recently announced at IFA. The photo above shows the BlackBerry Z30 fully powered on and it looks like it is on its setup page. The BlackBerry Z30 is said to feature a 5” 720p HD display, a quad-core Qualcomm Snapdragon S4 chipset clocked at 1.7GHz, an 8MP rear-facing camera, and will run BlackBerry 10. We should know soon when BlackBerry will announce the device. No doubt fans of Blackberry are looking forward to the Z30. When we learn more we will pass it on.